Five and a half years later, I discover my blog post. I had long forgotten about it. West Point wasn’t on the horizon when I first wrote this. Nate had graduated from West Point and is in the middle of Ranger School. WOW! I don’t get it and I guess I never will. While driving to see family in South Carolina, Nate spotted a sign to a store I would have easily overlooked. just an Army issue green sign which read Military Supplies. It’s a guy thing I guess because I didn’t have the same reaction as my DH and OS did as we parked our van. My boys and husband practically skipped into the store, it’s true, you NEVER, EVER skip into a military store but it sounds funny!). This was probably one of the few stores I have ever entered in my life where I was almost completely sure I wasn’t going to spend any money. Everything you might ever possibly need regarding the military was there. We’re talking K-Rations, camo pants, gas masks, resin replica assault rifles which my three OS really wanted, hand grenade candle holders (they wouldn’t match my decor) and more. Parachute jackets, ammo boxes, metal helmets, you get the picture. The entire store was basically covered in brown, green or black. I couldn’t find one pretty thing in the building! This was really man’s land. Only upon exhaustive searching, did I discover one teeny spot of thin, pink piece of nylon rope which made me feel only a little bit better. My husband and sons were fascinated, I was ready to go. We walked down the aisles and when we spotted the plastic military shields for $25, it was almost more than they could handle. I guess the girl equivalent would be like going to Archivers, a scrapbooking store. I felt like quite a good wife and mom venturing into a place like that but I know that they have gone into candle stores and boutiques humoring me. 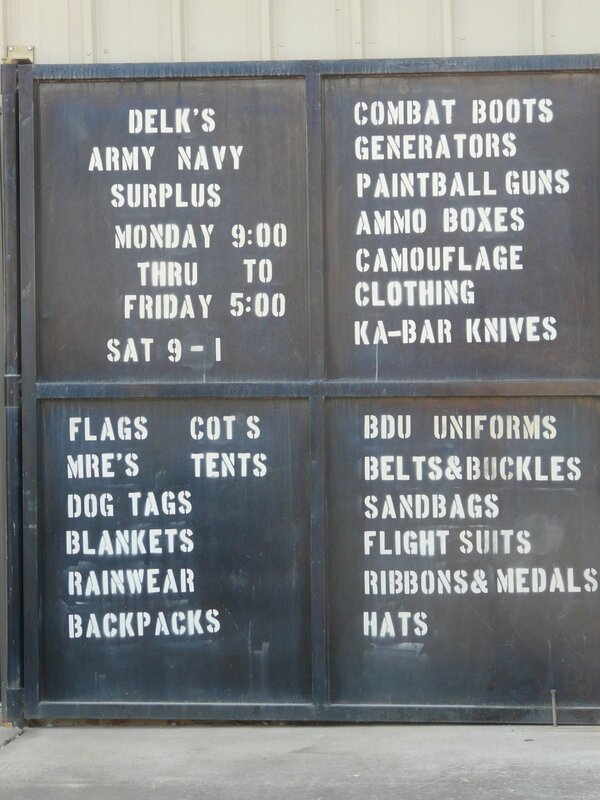 In a way, I actually found Delks Army-Navy Surplus store quite interesting but not so much so that I have to go back anytime soon. As I looked at the sign, I noticed a typo. Can you spot it? Too bad I didn’t have a machine gun to shoot in an apostrophe. At least now I know where I can get one! Questions: Have you ever looked back on your children’s interests and seen the signs of their future vocation? If you have younger kids, do you see indication of your children’s future profession in their current obsessions and activities? It’s fun looking forward and backward! Oooh-Aaaahh!It’s a man’s world after all. But we sure like having that gun toten-hand grenade throwin-vital cooken-arm punchin woman along to keep us company. Thanks for being a good military mommy (and wife). I feel like I need to spit or something manly after reading that. Is this what is in my future. Its about all I can handle (typo intentional). My husband and 4 sons have always liked those stores. They kinda have a certain odor which is between moth balls and mold. Other that that, I have to admit I like going in them sometimes too. My Ranger son played with GI Joe’s and cars a lot and did every high adventure zip line, mountain climbing, etc. he could do. His older brother did too and he is a dentist. I’m not sure what the other 2 will do. : ) It’s all good. True, Sandy, it’s maybe like me in a fabric store. Endorphin city. I’ve always liked those sort of things aside from my stint as a rejecter of all things domestic. It sounds like you have found a wonderful balance in honoring those special interests of your guys and having some of your own! I think you have a very cool family! Wow! Thanks for your comment!